NOI-Polls: Questioning the $1-a-Day Poverty Threshold: Myth or Reality? Questioning the $1-a-Day Poverty Threshold: Myth or Reality? Abuja, Nigeria. April 24, 2013. Executive Summary - The dollar-a-day poverty threshold is considered to be one of the globally recognised measures of poverty. According to the National Bureau of Statistics (NBS) about 61 percent of Nigerians live on less than $1 a day. Over the years, this figure has elicited comments and debates from scholars and analysts calling for a review of this threshold to reflect a more realistic poverty line. In order to contribute to the poverty discourse, NOI Polls has conducted its recent polls to estimate what Nigerians spend daily on feeding. 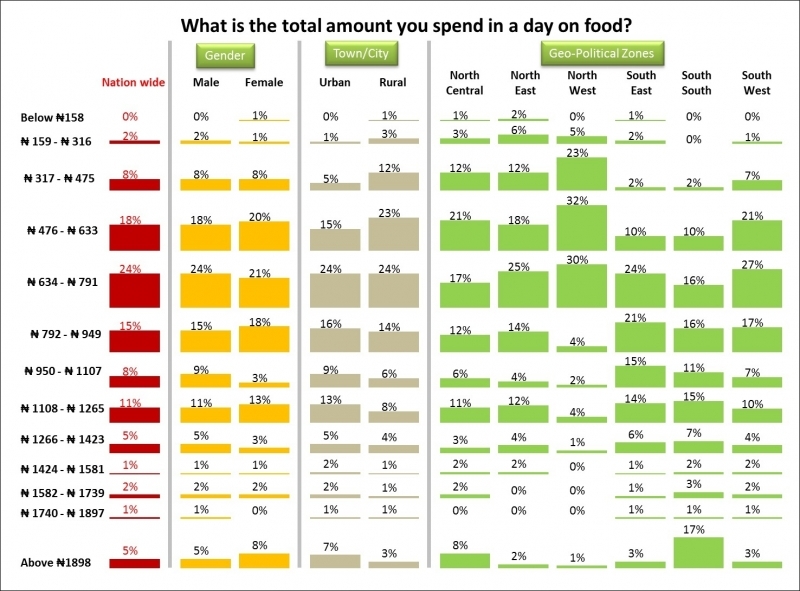 Key findings from the poll reveal that, on the assumption that people eat at least once a day, only about 2 in 10 Nigerians (19%) were found spending below N160 (US$1) for their meals in a day, with 80% spending above the threshold. Furthermore, on the assumption that people eat at least three times a day, the results indicate that less than 1% of Nigerians were found to spend below N160 daily. In summary, given that these current figures only focus on daily food estimates, and not shelter, clothing or transportation, we therefore submit that a lot more Nigerians live above US$1; and call for further investigation and, perhaps, a review of the dollar-a-day poverty threshold. Background - In February 2012, the National Bureau of Statistics (NBS) released its report titled “Nigeria Poverty Profile 2010”, which stated that about 61.2 percent of the population (more than 100 million Nigerians) were living on less than $1 a day at the end of 2010. This figure represents almost a 10 percent increase from 51.6% that were living on less than US$1 in 2004. This statistic suggests that the majority of Nigerians live in poverty and, as a result, can barely afford the basic necessities of life such as food, shelter and clothing. Although there are several approaches to measuring poverty such as the relative, absolute and subjective poverty measures, as well as the income inequality and consumption expenditure measures, the dollar-a-day poverty threshold has been considered one of the globally recognised measures for poverty. 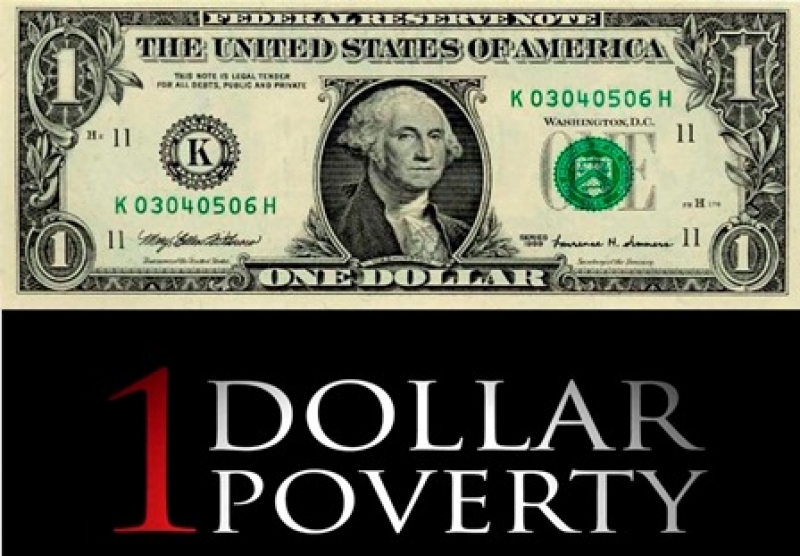 The dollar-a-day is a common international poverty line developed by economists in the late 1980s. A group of economists at the World Bank in Washington DC noticed that a number of developing countries drew their poverty lines at an income of about $370 a year which reflected the basic amount that a person needed to live. Each country had a different sense of what the essentials were, but the figure of roughly $370 was common to all, so the World Bank team proposed it as a global poverty line. If you divide that $370 by 365 days, you get just over $1. So the catchy "$1-a-day" concept was born. However, over the years, the dollar-a-day poverty threshold has been criticised both locally and internationally, with scholars, statisticians and development agencies reconsidering more realistic poverty measures to align with changing economic indices. Away from the US$1-a-day, the World Bank now adopts a standard measure of US$1.25 per day. Similarly, in 2012 the African Development Bank (AfDB) adopted $2 per day as the poverty line for the continent, and found 34 percent of the population above it. Closer home, the $1-a-day measure continues to be questioned as analysts argue that the proponents of the dollar-a-day statistic did not actually convert $1 to naira to determine what could be bought by an average Nigerian. They calculated a specially-adjusted dollar using the Purchasing Power Parity. This technique asks how much money would be needed to purchase the same goods and services in two countries, and uses that to calculate an exchange rate. A detailed analysis provided by Enhancing Financial Innovation and Access (EFInA), a donor-funded organisation, estimates Nigeria’s adult population at 87.9 million. It further divided this total between four million adults earning above N70,000 ($440) monthly, 38 million adults earning between N18,000 and N70,000, and the balance 45.9 million adults (52 percent) earning below the national minimum wage of N18,000. There remains an on-going debate in Nigeria regarding the reality of the dollar-a-day statistic. Opinion leaders have questioned the finding by NBS that the majority of Nigerians (61%) live below the poverty line. Specifically, analysts have been asking: Is it true that most Nigerians live on approximately N160 (US$1) a day, given inflationary trends and the rising cost of basic essentials such as food, shelter, clothing and even transport. Against this background, NOI Polls conducted this latest poll to examine the assertion that most Nigerians live on less than $1 a day. An additional objective of this poll is to validate the suitability of the dollar-a-day statistic as a measure of poverty in Nigeria. It is expected that the results and findings from this poll will provide some evidence to contribute to the on-going poverty debate and generate some useful data to support policymakers in the area of poverty alleviation. We also hope that it serves as a platform for future scholars and analysts researching into poverty in Nigeria. Methodology - In conducting this study, NOI Polls adopted an expenditure approach to estimating the cost of one of the basic necessities of life. Food, clothing and shelter are considered basic necessities, and we decided to estimate the daily cost of food. The decision to poll on food was made because food remains the key sustenance to life. Also, we believe every Nigerian eats food to survive and will be able to easily relate with “food”, and unlike shelter and clothing that may elicit relative responses. We have also made the assumption that every Nigerian eats some form of food at least once daily, and have compared this with the assumption that Nigerians eat three times daily. It is worth noting that while this approach “to estimate the daily cost of feeding” may appear simplistic, its robustness is grounded in the scientific process of selecting respondents. Moreover a poll for the general public requires specific skills to design questions that are simple and easy to understand by the “average Nigerian”. In furtherance, the poll involved telephone interviews of a random nationwide sample and was conducted from March 18th to 19th 2013. A total of 1,002 randomly selected phone-owning Nigerians, aged 18 years and above, and representing the six geopolitical zones in the country, were interviewed. With a sample of this size, we can say with 95% confidence that the results obtained are statistically precise - within a range of plus or minus 4%. The questionnaire was designed in English and the poll was conducted in English, Hausa, Yoruba, Ibo, and Pidgin, to ensure coverage of relevant geographical and demographic groups. NOI Polls acknowledges that this report may be limited by its sampling restriction to only “mobile phone-owning Nigerians”. However, previous survey results by the National Bureau of Statistics (NBS) have suggested that about 63.9% of Nigerians own mobile phones (NBS, 2012), and more recent figures from the Nigerian Communications Commission (NCC) have stated that Nigeria has 143,327,286 active GSM lines (NCC, 2013). Therefore, our decision to adopt telephone interviews, and the validity of our polling approach, are hereby justified. Results & Findings - Respondents to the poll were asked people three specific questions. The first question sought to establish what Nigerians eat for breakfast, lunch and dinner. Respondents were also asked: What type of food do you typically consume for (1) Breakfast (2) Lunch and (3) Dinner? Overall, the majority of respondents (42%) eat Bread for Breakfast, followed by those who eat Rice, Spaghetti or Noodles (22%). Ball foods (such as Eba, Fufu, Semovita and Amala) were mainly consumed for Lunch (50%) and Dinner (48%). Similarly, the Rice, Spaghetti and Noodles food category was the second most popular option for both Lunch (35%) and Dinner (34%). Next, in order to ascertain where Nigerians eat their meals, respondents were asked: Where do you mostly eat your for (1) Breakfast (2) Lunch and (3) Dinner? The results show that for the majority of respondents (76%) Breakfast is mainly either eaten at home or taken from home to be consumed elsewhere. This also applies to Lunch (36%) though the proportion refers more to those who take food from home to consume at work or elsewhere. Other popular places where Nigerians eat Lunch are Canteens (25%), Restaurants/Eatery (21%) and Bukas (17%) (i.e. local food joints). Once again, the results show that majority of Nigerians (87%) eat Dinner at their homes. Finally, in order to estimate how much Nigerians spend on their daily meals, respondents were asked the most critical question to the study: Personally, how much do you spend daily on (1) Breakfast (2) Lunch and (3) Dinner? Respondents were encouraged to estimate for only themselves even when they eat communally. The results show that for breakfast the slight majority (29%) spend between N160 to N239 (an average of N 200), closely followed by 27% that spend between N80 to N159 (an average of N 120). Also, most Nigerians spend more on Lunch and Dinner, than on their breakfast. The majority spend between N240 andN319 (an average of N 280); Lunch (33%) and Dinner (39%). Taking a look at the figures for each meal independently, the results show that, for Breakfast, Lunch and Dinner only 30%, 14% and 13% of respondents, respectively, feed on less than US$1. Therefore, based on our initial assumption that people eat at least once a day, an average of the three percentages reveal that only about 19% of Nigerians live on less than US$1 a day. See Table below. However, when we conduct further analysis based on the assumption that people eat at least three times a day, the results present more interesting findings. Linking this to the dollar-a-day measure, the amount spent on each meal was totalled and further analysed to determine the total amount spent daily on feeding. Overall, the results show that the majority (24%) of respondents spend between N634 to N791 (an average of N713 on feeding daily). 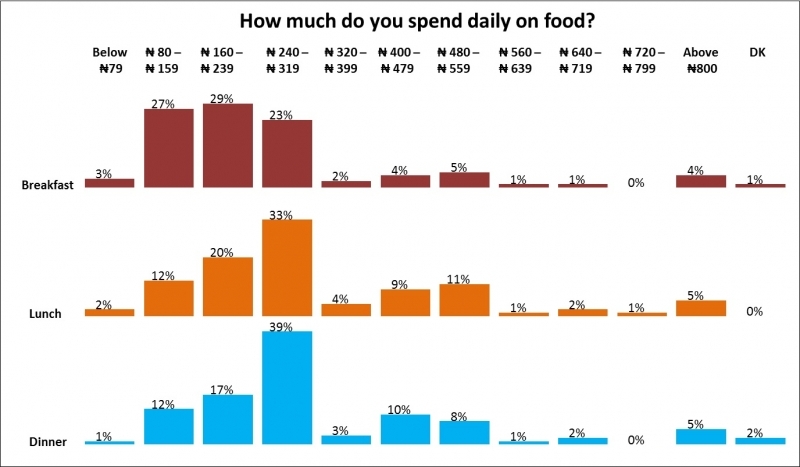 Again, this clearly shows that almost all of the respondents that participated in the poll spend more than N160 (the equivalent of US$1) on their feeding each day. Surprisingly, the national average of N713 spent on food each day did not present any significant difference on whether respondents live in rural or urban areas. Although, as expected more people living in rural areas spend less on their daily feeding; and more people in urban areas spend more than the national average on their food. Further analysis across geo-political zones shows that the majority of respondents in the North-East spend below the nationwide average of N713 (an average of N555). Also, the majority of people living in Southern Nigeria (South-South, South-East and South-West) spend more than the national average of N713. In particular, the South-South has the highest proportion of people (17%) who spend the most on their daily feeding (above N1898). Even though it is a paltry 2%, the North-West has the highest number of people that spend below the $1 mark on their feeding. Nationwide, less than 1% of the respondents actually spend below the $1 mark on their feeding daily. Considering that the costs of shelter, clothing and transport have not been added to this analysis it becomes clear the assertion that 61% of Nigerians live on less than $1 a day becomes questionable. In conclusion, results indicate that, on the assumption that Nigerians eat at least once a day, only about 2 in 10 Nigerians (19%) live on less than a dollar-a-day; while about 80% live above the poverty threshold. Furthermore, on the assumption that Nigerians eat at least three times a day, the results indicate that the majority of Nigerians spend an average of N713 ($4.5) on their feeding each day; and less than 1% of Nigerians actually live on less than US$1 a day. Finally, bearing in mind that the costs of shelter, clothing and transportation have not been added to these analyses, it becomes clear that the assertion that 61% of Nigerians live on less than US$1 a day is questionable, and calls for further investigation and review of the dollar-a-day poverty threshold.